Successfully Added DVR in Car Key Style to your Shopping Cart. No one will ever suspect they are being secretly recorded! 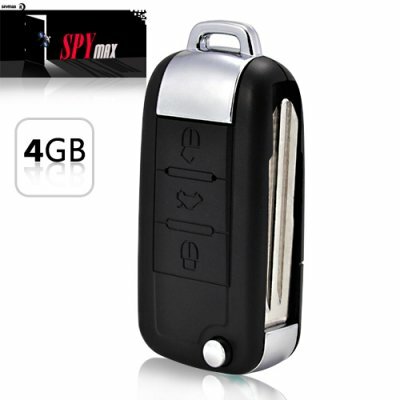 This covert camera is disguised as a standard car key + alarm remote for your keychain. It features a virtually undetectable pinhole lens, 30 FPS recording, and vivid 720 x 480 AVI video recording. If you’re looking for a totally covert gadget that can be placed just about anywhere without suspect, then continue reading to learn more. The I79 comes with a 4GB micro-SD card so you will never miss a scene again. You can use this undercover gadget to record hours of business meetings or interesting events, or to catch your boss or husbands abusive behavior in the act. And with the easy one button recording you can easily capture video on a moments notice, anytime anyplace. This device can also be used as a standard Mini DV recorder for candid shots, but in a highly convenient keychain form factor. In addition, you can easily connect the I79 to your computer via USB to use as a USB storage drive. Add this item to your cart now and never miss a moment again. The I79 is available for bulk discount orders and is in stock now and ready for immediate shipping. This product is not intended to replace your standard digital video camera. For the best results use this product for stationary video recording only. Fast motion recording might lead to image blur. Does this product also have a voice recorder too? The product has a microphone however the subject will have to be near the device to record sound clearly. How do you set the time/date with this device? 3- Save the TAG.TXT file in the root directory of the device. 4- Unplug the device and power it off. 5- Turn the device back ON and record. The image quality and construction are ok for the price. WORKS WELL. VERY STRONG. BE AWARE, THERE IS A PINHOLE RESET OPPOSITE THE LED! It's very light weight, much less then a real key remote, so if anyone picks it up it would be an obvious fake. The picture quality is excellent, much better than some of the other products I've tried. The webcam function is nice and it works well, although a clip may have been nice. You'll get a little over an hour on a full charge. I think given the price this is a good product. on 2010-10-02 01:19:38 Great Products. I almost agreed with my friends that it's another Scam.But NO,it's not.i just recieved mine now, and it worked well.just trying to check the battery life...Will order for another produst now.If you like it go for it.